Model E, Virtual subtractive synth from Steinberg. 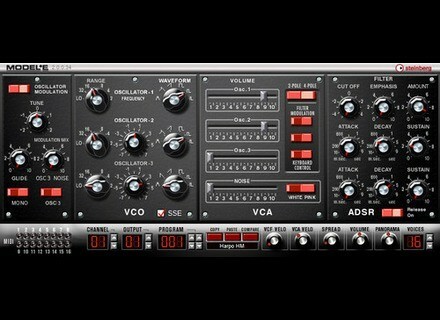 Some older plugins have been revived by Steinberg and are now operable on the newer operating systems. Here is what Steinberg had to say: "Throughout the long history of Steinberg, many products have come and gone, many have been superseded by new variants and others have been dropped completely. Once in a while, however, some of our developers like to dig up one of these long forgotten gems and polish it ready for current operating systems. As these revived products remain discontinued, their updates are notofficially supported. Updates for discontinued products are sporadic as these are voluntarily provided by our engineers in their free time." Download them at the Steinberg website. FabFilter Updates All Plugins with AAX Support FabFilter has released updates for all FabFilter plug-ins, introducing support for the new AAX plug-in format in Pro Tools 10. Ozone 5 Intro Pricing Extended iZotope announced that their intro pricing offer for Ozone 5 and Ozone 5 Advanced has been pushed back until January 2, 2012. Line 6 Mobile In Line 6 announced today the shipment of Mobile In digital guitar interface and Mobile POD guitar tone app.